Are you adopting a new puppy or dog from your local animal shelter? If so, congratulations! You’re about to add a lovable, loyal canine to your household. Before you bring your new puppy or dog home, it’s best to have the proper supplies ready to go. Here are five suggestions for your list of supplies. There are so many options for dog food today that it can be overwhelming. The best approach to buying food is to choose a supply that is age appropriate. For instance, if you decide to choose a puppy from the local shelter, opt for food designed for puppies. This food will have the nutrients, vitamins and minerals puppies need to grow up in a healthy way. Alternatively, an older dog needs a type of dog food designed to keep its bones strong, vision sharp and heart healthy. Simply check the label of the dog food to be sure you’re purchasing what is appropriate for your dog. Getting the appropriate dog food can start your life with your new dog off on the right foot. A dog bed is an important item to get because you want to show your dog where it will sleep from the very beginning. This will prevent your dog from being confused about where it’s supposed to go at night. Plus, having its own bed can help your dog feel more at ease in its new home. When looking for a bed one option is to visit VPD for dog beds online. You can put a blanket or a toy in the bed to encourage the dog to go there whenever it needs to rest. 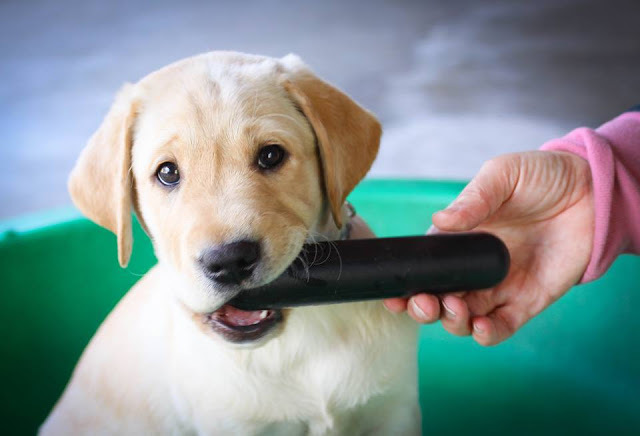 A water bowl and a food bowl are two other items to include on your supply list. You may want to get bowls with a rubber base if you plan to put them on a linoleum or tile floor. This type of base will keep the bowls from sliding along as your dog is eating or drinking. There are also food and water dispensers for dogs. These can be pre-filled, so you don’t have to fill them each day for your pet. Be sure they are not leaking and clean them when needed so they don’t develop any bacteria that can harm your dog or make it ill. Food dispensers for dogs are helpful if you work long hours and can't return home to feed your dog in the morning or evening. With dog food and water dispensers, your dog is free to get food or water whenever it wants to. Having a supply of chew toys is especially important if you plan to get a puppy from the animal shelter. A puppy has teeth that are still growing, and they need things to chew on that will soothe the pain that comes with tooth development. Of course, older dogs like toys too, but may not play with them as often as a puppy. Brushing your dog is important to its health. So, get a brush that’s appropriate for your dog’s coat. Some brushes are designed to clean the coat of a short-haired dog while others are perfect for long-haired canines. Brushing your dog gets rid of loose, dead hair and dirt. This prompts new hair growth in your dog’s coat. In addition to keeping your dog’s coat healthy, brushing your dog each day is a way to bond with your canine and gain its trust. Lastly, these are five supplies to have on hand when your dog comes home from the shelter. There are other things you will need such as vitamins, nail clippers and a leash, but you can get those after your dog is home and settled into your household.